In this article, we have an overview of all the main battles in Star Wars: Galaxy of Heroes and which are the best characters to farm here with some useful tips. Now that we have already informed you in a beginners guide about the game, we will now go directly to the farm guide. Also visit the best characters and teams for Star Wars: Galaxy of Heroes. In cantina battles, most battles have a chance to provide a shard for a specific hero. The most commonly farmed heroes with this method are Chewie, Luke, Talia, and Consular. If you’re a free player, it’s usually a good idea to promote Chewie at least once. He’s a strong free hero, and one that you will use for quite awhile if not the entire time you play. As far as Consular goes, Luminara is pretty much a straight upgrade for him in every way. If you’re going to go for Luminara early, you don’t need to invest heavily in promoting the Consular at this point. You’ll always want him at a reasonable level for the sake of Galactic Wars, but by the time you farm him to 4* in Cantinas, you could easily have Luminara already anyway (who is unlocked at 4*). If you’re not planning on going for Lumi, the Cantina battle is the only recommended way to farm shards for Consular. Talia is generally not considered a great option for farming in Cantinas unless you’re going for a nightsister team. She’s strong, don’t get me wrong, but there are better options for early farming. Luke is a strong attacker and worth getting if you’re hurting for attackers on your squad. If you get him early and keep his gear and abilities leveled, he synergizes well with a lot of leaders, and a lot of people consider him a hard-counter to Sid with his Tenacity leader ability. Now, you also get Cantina credits each time you complete a Cantina battle, which can be used to purchase Cantina shipments. Do not get ability materials with these. They are not a cost-effective use of Cantina credits. Avoid purchasing them here. The most commonly farmed heroes from Cantina shipments are Daka, Fives, and Boba. Daka is probably the most common, because another healer is a great addition to most teams, anyway, but her resurrection abilities are very useful in many encounters. Also, she is generally considered a requirement for higher level Dark Side battles, as the only other Dark Side healer you’ll see is Talia. Fives is great, too. He’s very tanky, has good damage, and has devastating counter attacks. Can’t go wrong with him. Boba is solid, too. He has some good damage, decent utility, and his leader ability is a staple in many comps (critical damage). 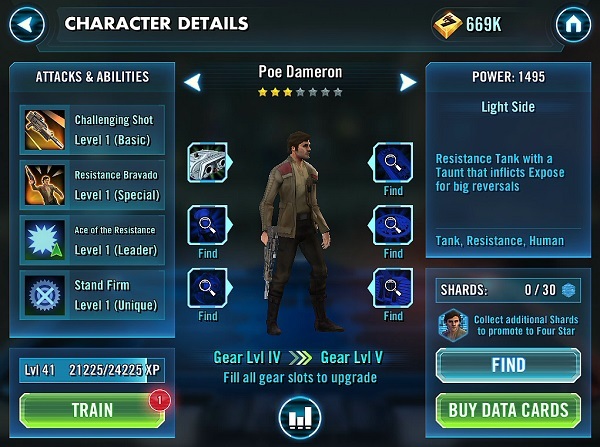 Another hero that has been getting mentioned lately is Poe. he is a pretty solid tank at later levels and has some good utility. Ahsoka is a love/hate, comp-dependant pick up. Great damage, high crit chance, and a team heal proc. Personally, I got lucky and pulled her 3 times from Bronziums, so I farmed her first. In the current meta, you can’t really go wrong getting any of those heroes. Any other investment carries with it a risk. Do not farm Stormtrooper or Jedi Guardian. They are not in very good places as heroes currently. Sidious is the most farmed-for hero from Arena shipments. You cannot go wrong farming him all the way to 7* first, from Arena shipments. He is, a very safe pick. As well as others players say that his strength becomes more balanced later in the game, but still praise his healing debuff and speed. EA has shown interest in developing other characters with this Healing debuff, and if any one of those characters becomes as readily available as Siddious, his staple nature will be lost completely. So that’s something to keep in mind as well. If you really don’t have an interest in Sid, farm someone else. Other good options for Arena Shipments are HK-47, who is a solid hero and a staple in droid teams, IG-88, good damage, and another staple in droid teams, Stormtrooper Han, who is a pretty good tank (there’s a lot of dissenting opinions surrounding him, but you won’t be gimped by farming him), and Savage, who is pretty tanky with decent damage. Ventress is fun and does decent damage and has good utility, but is really buggy right now and a lot of players recommend avoiding her until she (or her tooltips) get looked at by the devs. Most commonly farmed here is Luminara. Probably the best attacker in the game. Great damage, great heals, ability block. Can’t go wrong farming her. IG-86 will sometimes be farmed for droid teams, as well as Poggle, who is largely considered a staple for droid teams. Phasma is also good farm here. She’s very strong, especially with other First Order heroes. Best to stick with one of those. If you want to know if there are cheats for Star Wars: Galaxy of Heroes, check out the previous guide. 3 Comments on "Star Wars: Galaxy of Heroes – Farm Guide"
Plèbes Where can i fond the inventory? Sorry Where can i find the inventory in the principal page? You can’t. The inventory was taken away a few updates ago. It was when the shard shop was added to be exact. They also took away the ability to sell extra equipment. They did that because no one was using the sell option, but they didnt consider it was a new game. I never once sold anything, but now, after half a year playing, i have PLENTY to sell.